I have a habit of eating out of season. It not unusual for me to want a good, rustic apple pie and a bowl of chicken noodle soup in the dead of summer or an ice cream sundae and a fruity, leafy salad in the winter months. The problem is that I love food way too much and I'll eat it any way, time, or how I can get it. My body clearly knows no seasons. One thing is for sure - I love my desserts. Cakes, cookies, doughnuts, pastries? There are some days I can't get these baked goods in my face fast enough. But pie? Pie holds a delicious nostalgic connotation behind it for me. You see, my Mom made pies from as far back as I can remember. When I was about six, she worked in the kitchens at a very popular local orchard. She was one of the principal bakers and responsible for all the tasty desserts that went onto and into the display cases and tables. Her speciality was the rustic apple dumplings and peach pies - one of my FAVOURITE pies to this day. When the orchard's pear trees finally reached maturity and bore fruit, her pear cobbler, crisps, and pies sat proudly on the tables with the other seasonal fruit desserts. When the orchard shut down for the season, Mom picked up where she left off and continued the baking frenzy in our own kitchen. Several years later, when I was about ten or eleven, Mom was offered a fantastic job in a completely different line of work. Unfortunately, when she left the bakery, it was never quite the same. We'd visit often, but the baked goods left a lot to be desired. Thankfully, the fruit trees always welcomed us with open arms and remained true. Sadly, about ten years ago, Mom called to tell me that the orchard closed its doors forever as the owner's children chose to sell the land rather than keep it going. I can still feel the aching sadness I felt when I first learned this news. I swore up and down if I had a sackful of money, that vast property would be mine. A once thriving, beautiful piece of real estate is now just withering away, not properly fulfilling its purpose. Did I just confuse you with that story? Let me explain. You see, my beautiful friend Aimée's cookbook, Brown Eggs and Jam Jars, brought back parts of my childhood that lay dormant in the back of my mind. Her photos, her stories, her recipes brought back a nostalgic aspect for me; it took me back to an innocent time. Her simplistic approach to eating seasonally is beautifully documented; Brown Eggs (Spring) and Jam Jars (Autumn) with everything in between. Aimée is a self-proclaimed urban homesteader. My Mom, despite throwing us McDonald's birthday parties so we didn't feel left out from the other kids, was also a bit of a homesteader in her time as well. In a roundabout way, Aimée reminds me of a much younger version of my Mom. We had some of the most gorgeous gardens in town and Mom made sure we understood the importance of good, healthy food while indulging our sweet tooth as well. And she was always feeding everyone - friends, family, the neighbourhood; no one went hungry when Tootie (that's what everyone calls Mom) was around. Potlucks, BBQs, church functions; Mom's goods were always the star of the show. Every summer without fail, she would take the unused, dusty jars from the basement, clean them up, and can the bounty from her garden. I imagine Aimée to do the same. Aimée brings food basics to the forefront, focusing on three important aspects: Family. Food. Life. This same mantra, if you will, also serves as her personal trademark. She creates recipes that are wholesome, yet delicious that any parent would be proud to serve to their family - or the neighbourhood. I was super chuffed to have the opportunity to review her cookbook, especially after many months of teasers from her on social media and her blog. The verdict? As expected. She nailed it. Aimée shares everything from how kids can learn life lessons from the garden and talking to them about where food comes from, to canning 101 to preparing a menu plan. She also shares lovely stories in between recipes and chapters such as Jam Swaps and Holiday Gatherings. You can almost feel the love she's poured into this cookbook. My favourite page? 117, hands down. I could stare at that photo for hours. It is everything I long for in a dinner party. Aimee's Everyday Sandwich Loaf closely mimics a recipe I make in my kitchen, but she incorporates two wholesome ingredients that upped the ante for me. I thought the additions were absolutely brilliant and wished I would have thought of it myself. Her Buckwheat Buttermilk Pancakes are a big hit with my kids. Unfortunately, we don't hold pure maple syrup in the same high esteem as Aimée (I know, I hang my head in shame) but we're getting there. I mix half maple syrup, half pancake syrup in hopes that one day full on, proper maple syrup will be crowned king. I know it's blasphemy, but it's better than nothing I suppose. Baby steps, folks. Baby steps. Her Radish Chive Butter? FRIENDS. A quick disclaimer: You should know that I truly dislike radishes. Gag me with a spoon dislike. I find those red, Fraggle-Rock looking vegetables horrid, but guess who has a bunch sitting in her fridge as we speak? Seriously, I wanted to spread it over everything - and I pretty much did. She's made a believer out of me. But this pie. This Sour Cream Pear Pie with Cornmeal Pecan Streusel reminded me of many beautiful childhood memories aforementioned. The paring of pears and sour cream gives it a lush creaminess while the pecans and cornmeal streusel give it necessary crunch and texture. Was this pie a success? If you call eating half the pie while catching up on Reality TV episodes I've missed, going in for the last bite, but realizing it had already been eaten before one could mentally prepare oneself for it, then yes. It was a success. 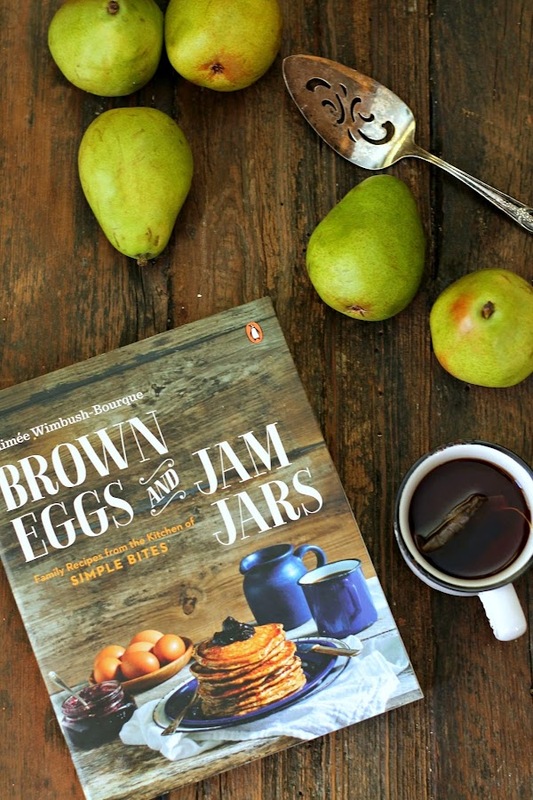 I'm giving one lucky reader (courtesy of Penguin Random House Canada) a chance to win a beautifully signed copy of Brown Eggs and Jam Jars by Aimée and the photographer, Tim Chin! I'm also participating in a Food Bloggers of Canada Brown Eggs and Jam Jars Blog Tour and I implore you to check out all the gorgeous eats some of my fellow bloggers across Canada have whipped up in their kitchen. Congratulations and big love, Aimée! Your cookbook is as lovely as you are and a beautiful insight to your world. This giveaway is open all legal residents of Canada and United States who have reached the age of majority at the time of the contest in the province, territory, or stet in which they reside. Winners must answer a skill-testing question. Giveaway will run from Wednesday February 18, 2015 to Friday, February 28, 2015. Winner will be contacted via email and displayed on Rafflecopter widget. Email address will never be given out to any third party or anyone for that matter. Dislosure: I was given a copy of this cookbook by the lovely folks over at Penguin Random House Canada Limited; one to keep, one to give away. As anything and everything I review, all opinions and views are completely my own. I will never endorse anything I don't love, use, or believe in and will always give my honest opinion regardless. I love pies too! They are so intertwined with fall for me. Well, not really. I love pumpkin pie so much that I get my mom to make it for me for my birthday in May - ha! I've never actually had a pear pie, but Aimée's recipe looks amazing! My sweet potato coconut soup brings everyone over for a bowl! My yogurt berry cake is, by far, the top family favourite! My family enjoys my homemade pizza, topped with bacon. i make a lot of homemade pizza - never turns out the same way twice - sometimes it is awesome, sometimes it is just okay - but i like making it and add whatever toppings i may have in the kitchen. I really enjoy making muffins and breads for my family. I also love cooking spaghetti for them too. My Mom likes to make crepes with seafood insides. I myself like to be a little more informal with homemade pizzas or chillis. We enjoy pie at our house too. This new cookbook sounds wonderful. We love to make cookies in our house - we make them almost every weekend. This book would be a lovely addition to my collection! Right now, my specialty is my giant oatmeal chocolate chip cookie...not very fancy, but delicious! In the summer it's my Fruit Salad ... oh heck, it's not just for summer. It's something I'll make whenever we get a hankering ... much like you, my body knows no seasons. Baked Chicken Taquitos. So simple, yet everyone loves them! since I met my husband, it's been Banana Coconut Cream Pie! Sometimes I put a layer of chocolate in there too! I make Blondie squares. I'm usually asked to bring them to work functions or friends gatherings since they are rather yummy. Ramen noodles has lately been our specialty at home or macarons of course! I love to make home made popcorn shrimp for my family! My specialty is pie, usually either apple or huckleberry. I haven't tried making pear pie, though. I make pumpkin oatmeal cherry chocolate cookies every Christmas for my step-dad. Each year he proclaims them the best cookies he's ever eaten. Pumpkin pie is my most fav of all. I could eat the whole thing myself…..but I always share LOL. A delicious pasta dish featuring artichoke hearts, fresh spinach, tomatoes, and feta cheese! Always a hit! That radish butter is something I want to try. I have a love/hate relationship with them. I try to eat them to give myself variety, but it isn't something I look forward to doing. And yes, I have an unopened bag in the fridge. My favorite dish to make for family and friends is Tuscan Vegetable Soup. Chicken Parmesan is my specialty dish! Chili with rosemary/orange cornbread is my go-to dish, but I love having friends over and trying out new recipes on them! I enjoy making breads and soups, at least this time of year. In the summer we stick to grilling. I make a gluten free green bean casserole that everyone asks for. In the summer a brisket taco bar, and, in the winter, Butternut squash and apple soup with red lentils. My specialty would have to be bread. I love to make my own bread! A family favourite is my rhubarb custard pie. I feel I have perfected my mom's recipe. We grow our own rhubsrb. The chsllenge is to freeze enough some pies during our long cold winters in Ontsrio. I love to make pie, especially pear pie! 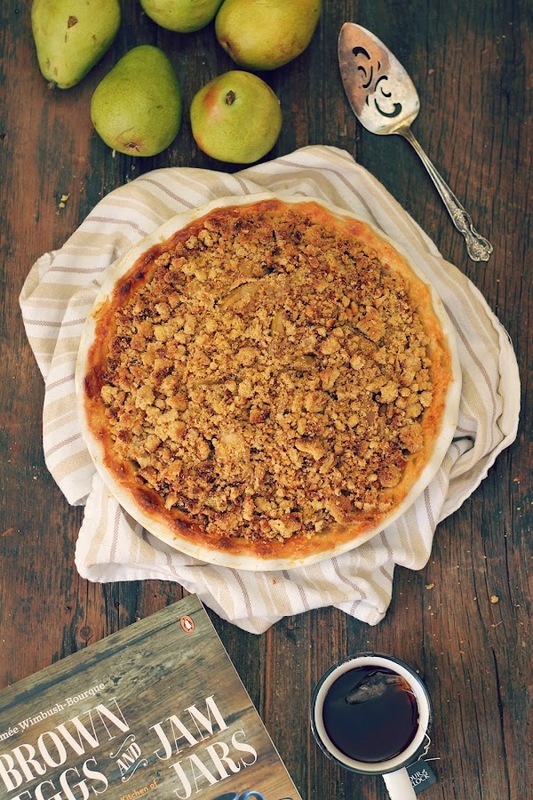 I'd love to try this recipe for pear pie. I love making rhubsrb custard pie. I have made some adaptations of my mom's recipe. We use rhubsrb from my backyard. Yum. A baked salmon dish that never fails to impress. So easy to! Everyone loves my yellow butter cake with vanilla buttercream frosting. always sweet with a lot of chocolate!